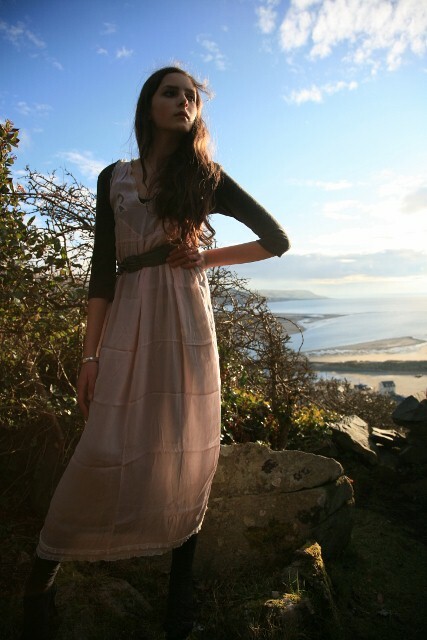 My latest obsession, clothes wise, is silk- preferably in dusky pink please! So you can imagine how happy I was when this amazing thirties silk night dress arrived on my doorstep, fresh from ebay. You can just picture the kind of glamourous woman who would have worn this, probably with a quilted satin bed jacket over the top. (Another thing I have been searching for!) The detailing is just so stunning, from the understated frills to the delicate bows. I always tend to look at things from a design viewpoint, so the little things always interest me. It took me a while to choose what to put it with, but after seeing this long grey woollen dress in my mum's wardrobe, I knew it would be perfect! I was very inspired by the kind of layering that Susie of Style Bubble does so well. I then added some ribbed grey long socks. (Me? Obsessed with socks? Particularly ankle socks? No, no- must be someone else you're thinking of..) These shoes interest me because they look really mundane when sitting on a shelf, but suddenly when you put them on with ribbed socks (yep, definitely not me with the obsession) then they look amazing. But they are a little difficult to put on in the middle of the coastal country side, standing on a slightly wobbly rock. The tied belt and grey beret are thrifted, and the silver bangle is a victorian one from a family member. We shot this outfit on holiday, and it was slightly awkward with lots of dog walkers going past me in my thirties night dress, posing on top of a hill. London Fashion week is now over, and although I couldn't go, I still got my daily consumption of fashion from the LFW website, the Sartorialist and Jill of http://streetstylelondon.blogspot.com/. The latter two showcased some amazing people with amazing style. Kinder Aggugini for the restrained colour palette and desirable classic pieces I can see exisiting in my wardrobe very easily, especially that tailored khaki/ brown coat-cape with the red detail. I discovered how much I liked capes recently when I found the two family inherited ones at the back of my mum's Narnia-esque wardrobe, and so was impressed to see quite few on the catwalk this season. Topshop Unique for a collection that totally reminded me of 'Where the Wild things Are'. Seeing it, I had one of those moments when I really wished I was a stylist so I could use some of the pieces in a Wild Things inspired shoot. The long socks + custom made head pieces + delicious looking coats and layering = Yes please. Betty Jackson for exquisite layering (being able to create leather underwear as outerwear without making it sleazy is quite an accomplishment!) and very cosy looking jumpers and coats. She makes dressing for winter look very desirable to me, even though I am longing for sunshine at the moment. Margaret Howell for the fact that I couldn't find fault with a single design. I'd wear every outfit that was showcased. All those skinny belts pulling in coats, jumpers and all other manner of beautiful things... I loved the shirts too, especially layered under dresses. Every piece looked like it had a longevity, a very classic feel. Aquascutum for the beautifully structured jackets and coats. You can really see the detail in each one. A very clever idea too, the reinvention of a single item of clothing in many different ways. The fact that the colour range was so minimal meant that you really focused on the shape and design. and B- looked really classic and chic. If I was talking in fashion speak, then I would probably say that they were 'investment pieces' or some other phrase along the lines of that. Kudos to anyone who has taken the time to read this whole post full of my ramblings! I'll stop now before this becomes long enough to qualify as a short non-fiction story. Hope you all have a great week. That dusty pink color really is special; soft and feminine without looking cheesy/too girly. Wonderful pairing of the slip with grey dress, socks, and hat. Pink and grey is one of my favorite color combinations (or perhaps I should say just about anything and grey haha). You have a lovely way of being able to pull off an old world (or would that be 'olde world'?) glamour that I see many models try to emulate and fail. It's really quite refreshing. Dusty pink has an interesting way of being paired with grey and other seemingly dull colours. I don't think I could quite pull it off, you do, however, pull it off quite nicely. Love the dress and I love the dusty pink. Love the seventh photo. It has a perfect light and the place is beautiful. You look lovely in that shade of pink. I love finding pretty vintage pieces of boudoir clothing- the shoes, the little bedroom jackets. So fun. I love your photos, your outifts are beautiful. what camera do you use?come visit! Love this look, it's really pretty! What eyeshadow are you wearing in the first pic? Roz, this outfit is a beautiful combination of rough and delicate textures. I love the idea of pairing warm wool with soft silky materials...and grey with muted pink is one of my new favorite color schemes. As always, I thoroughly enjoyed your post! Wow, this is probably my most favourite shoot that you've done, i especially adore the 3rd and 7th shots, the light hits you beautifully. I think you've styled the slip so well mixing the fabrics. Even the creases work well adding to the different textures. I really think you should get into styling as a career, you'd be amazing. Do we see the next Grace Coddington? All in all another great shoot, i'd love to see a book with all of them together and your inspirations behind them. It'd make a great coffee table book. Sorry for the longest comment ever, but 'm sure you understand. Beautiful pictures! THey're so inspiring!! Follow/visit my blog! that last picture of you is absolutely beautiful. these are so lovely! I have a few pieces like this that I'd like to wear. I think layering is definitely the answer. Pices like that are definatley too pretty to be kept only as nightware, it looks just perfect with the grey. What can I say, these pictures are breathtaking. 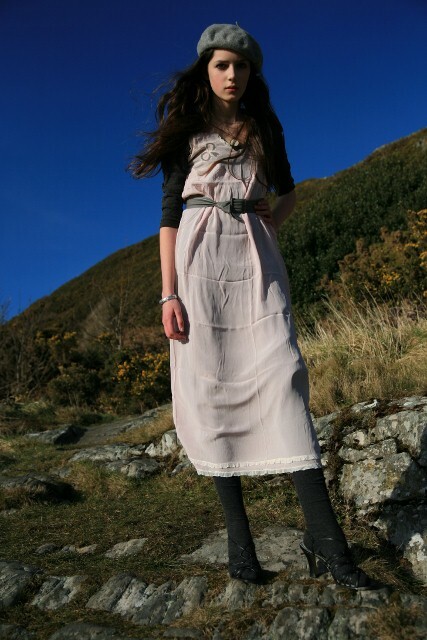 Oh, Roz, love these shots & am loving pale pink with grey these days, too! Nightwear as outerwear, great ; ) I can't wait to see the warmer weather follow-up, as you turn it into a summer dress.. it's gorgeous. I love the way you write: write as long as you want! And I agree: the word I kept hearing as people were walking out of the shows was how WEARABLE it was. I gather that's high praise indeed. btw, love the new header!it's very appropriate for the upcoming Spring season...I want warm weather so badly! just found your blog and it's stinkin' fabulous!!!! this outfit is absolutely stunning, you layer like a champion and i too am obsessed with dusty rose right now, yes please, indeed! you take beautiful photos. the new header is gorgeous, the chair exquisite. i loved your other headed too but i always had to scroll down to see if you had a new post and trust me i check your blog like twice a day, so i got pretty frustrated. I love your blog! I have tagged you in an award if you want to come check it out! you take such lovely photographs. i wish i had scenery like yours to take advantage of!